The Supreme Court on Monday announced it would not consider a case involving limits on random detention of motorists within 100 miles of a border. The case involves an Air Force officer, Richard Rynearson, who was detained for 34 minutes at a Border Patrol checkpoint in Uvalde County, Texas, despite authorities having no suspicion that he was an undocumented immigrant or criminal, Reason.com reports. 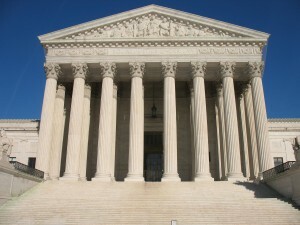 In a 1976 decision in the United States v. Martinez Fuerte, the Supreme Court concluded random stops at immigration checkpoints did not violate the Fourth Amendment. Posted: 3/22/16 at 8:53 AM under News Story.